ReSarah Wedding Shoes is a handmade shoes for two generations. Produce exclusive wedding shoes with professional handmade classic arts and our collection comes with the fitting shoes so you can find your size. Resarah is very comfortable to wear throughout your wedding day. Resarah Wedding Shoes is a handmade shoes from Taiwan’s Brand. Resarah means “Eternal Princess”. 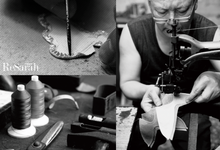 Established in 1776, inherit the skills and faith of handmade shoes for two generations. Produce exclusive wedding shoes with professional handmade classic arts. Resarah claims to listen every brides personalistic requirement and produce the shoes for their exclusive wedding. Handmade classic arts begin with every brides sweet wish.